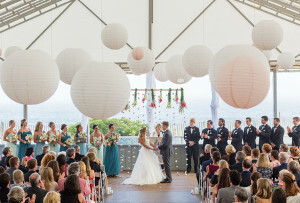 Get inspired by their colorful, beachy celebration on Cape Cod. By Rachel Kashdan·	 10/10/2018, 9:40 a.m.
Nine Christmas cards later, they were engaged. Lauren, who works for Komera, a Jamaica Plain-based education program for young women in Rwanda, was set to fly to Africa for a three-week work trip in March 2017. The day before her trip, David proposed while they were on a walk with their dog around Jamaica Pond. 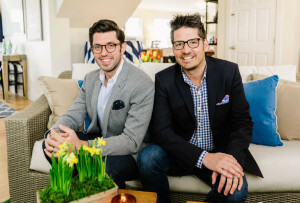 Later, he joined her during the final week of the trip to celebrate, and when it came time to plan their wedding, they drew inspiration from the memories they made there. 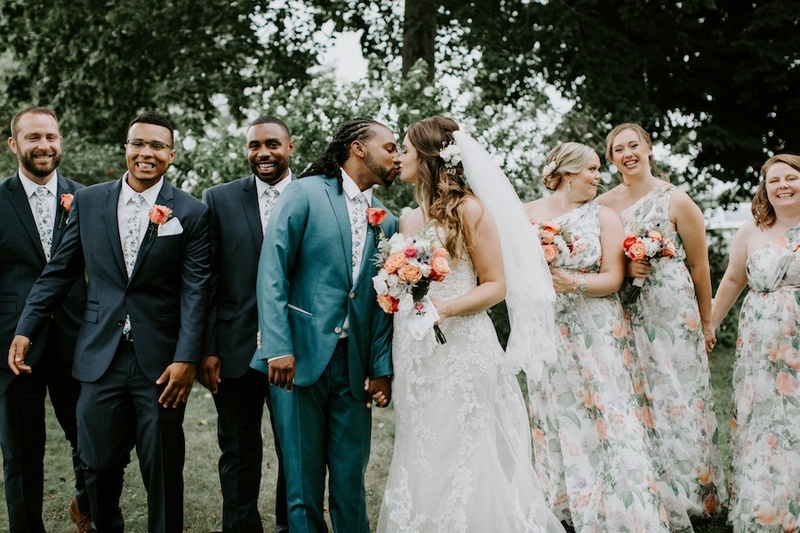 Their orange, fuchsia, and green color scheme, for instance, was inspired by fabric Lauren brought back from Rwanda, which her aunt then sewed into table runners for their reception. 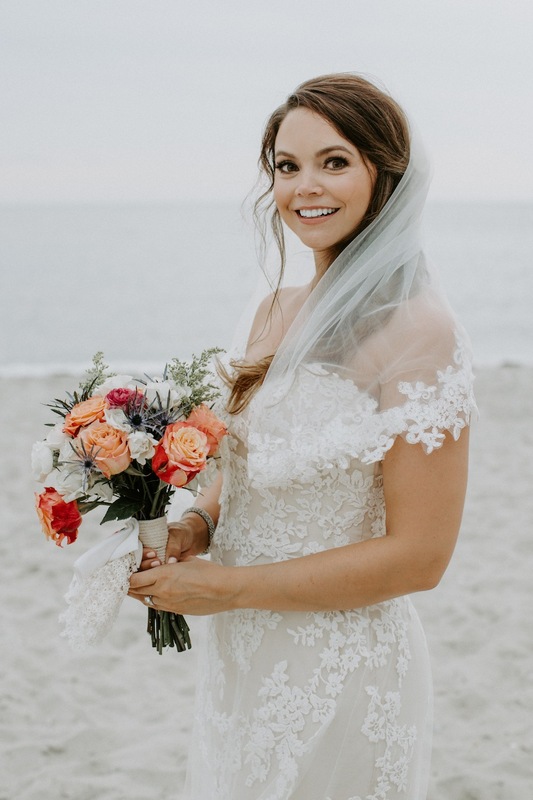 Choosing their venue was simple: Lauren’s parents own a house in Dennis, where she spent many summers and would often visit with David during college, so they knew they wanted a Cape Cod wedding. 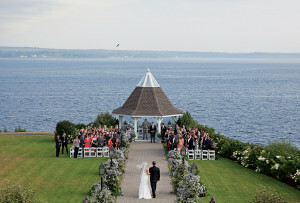 “Being married by the sea sounded beautiful, romantic, and just really special,” Lauren says. 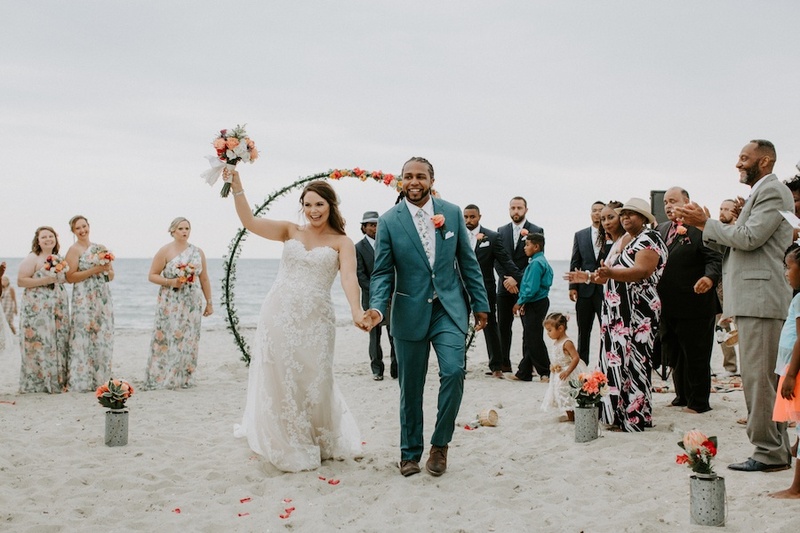 For their reception, Lauren says they wanted to remain true to their community values, so the Cultural Center of Cape Cod, which offers local arts programs and exhibitions, was the perfect fit. 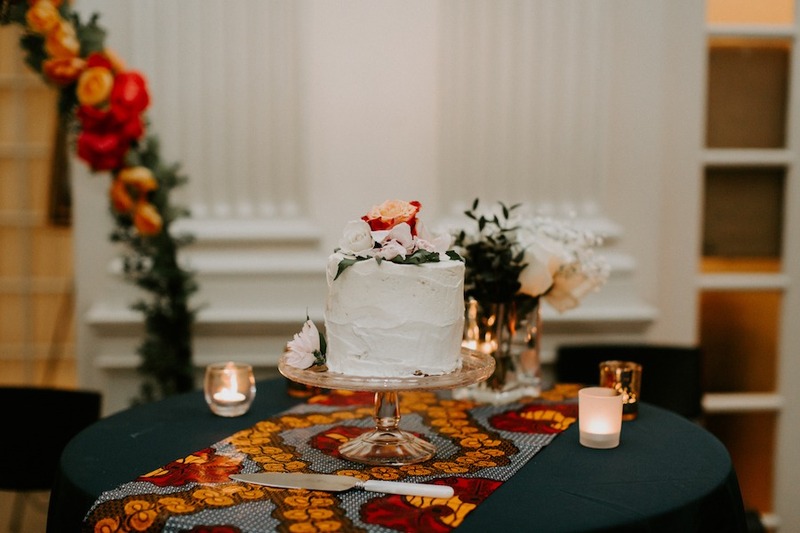 That spirit of community was woven throughout their celebration, too: Lauren’s best friend Grace baked the wedding cake, her Aunt Becky made cookies, and her mom grew the plants that were used as centerpieces. They also elected to have a cocktail-style reception, so that their loved ones could mix and mingle. “We just really wanted our families to have an opportunity to spend a lot of time together, talking and dancing and eating all night long,” Lauren says. 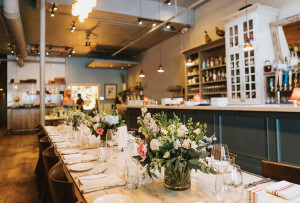 The couple says the palm leaf illustrations on their invitations, which were designed by a friend, reminded them of their travels to Peru, Mexico, the Dominican Republic, and Rwanda. 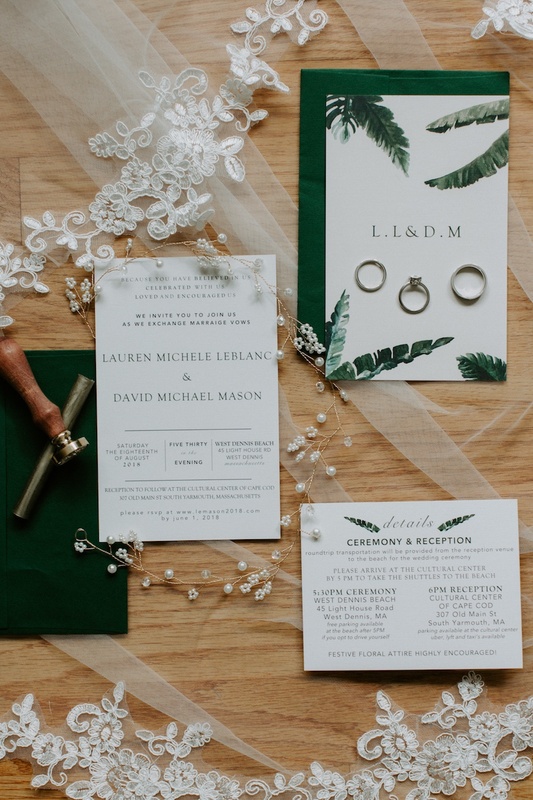 The theme of Lauren and David’s celebration was “festive florals,” and on their invitations, the couple encouraged their guests to don print on their wedding day. “We thought ‘how beautiful would it be to look out at our guests and see a sea of colors?’” Lauren says. 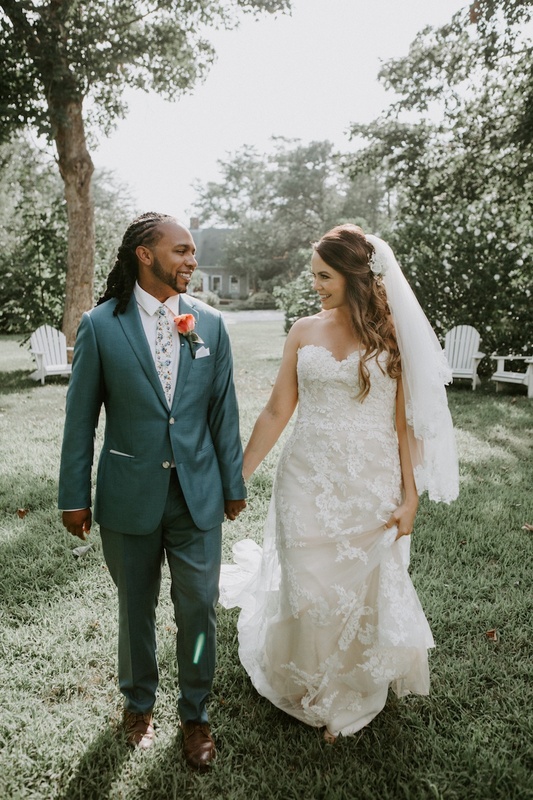 Lauren had originally wanted an airier, flowing dress, but ended up “falling for something a little more fitted,” she says, because she loved this Enzoani gown’s creamy hue and lace floral overlay. 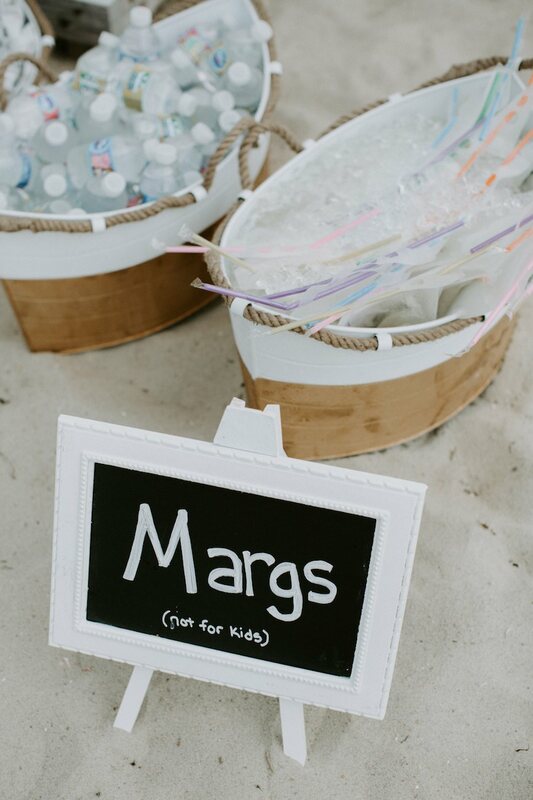 After the ceremony, as they readied to board buses to the reception, guests were treated to homemade, Capri Sun-inspired pouches of margaritas and Cape Cod Potato Chips. The couple’s standing ceremony was officiated by David’s uncle, under a circular wedding arch built by Lauren’s cousins. It was decorated by Lauren and her friends. “We loved the idea of having a circle, instead of a traditional arbor, because it symbolizes eternity and love,” she explains. Lauren’s bridesmaid, Grace, flew in from Ohio with pans in her suitcase to bake the couple’s banana cake with cream cheese frosting the day before the wedding. 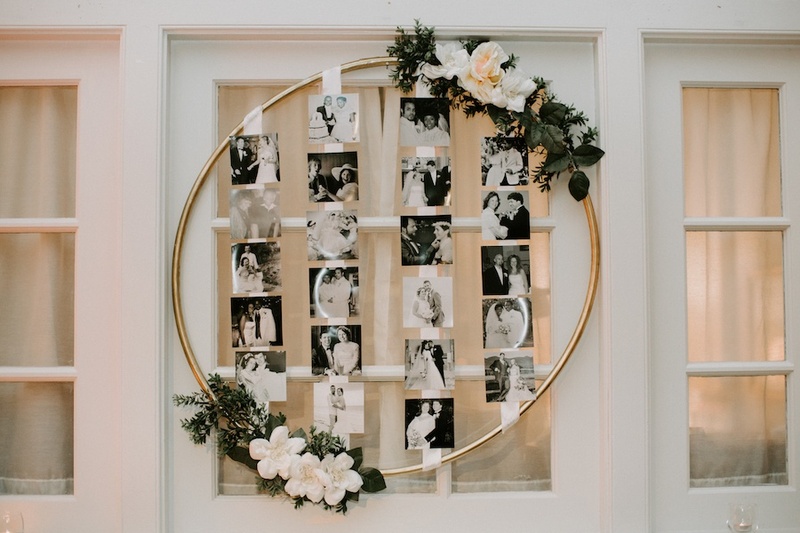 At their reception, Lauren and David displayed wedding photos from both of their families, as well as of close friends. “David’s parents have been married for 38 years, and mine for 32, so we have such beautiful examples of love around us and we wanted to celebrate that,” Lauren says.